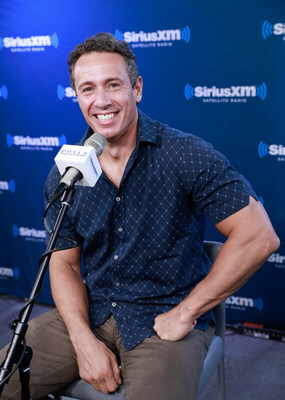 NEW YORK, Sept. 19, 2018 /PRNewswire/ -- Today SiriusXM announced that Chris Cuomo will host an exclusive two-hour weekday program on SiriusXM P.O.T.U.S. channel 124. Let's Get After It with Chris Cuomo will premiere on Monday, September 24, at 12:00 p.m. ET. His news program Cuomo Prime Time airs weeknights on CNN from 9:00 – 10:00 p.m. ET, which is simulcast on SiriusXM channel 116. Throughout two decades, Chris Cuomo has led no-nonsense interviews with major political leaders on both sides of the aisle, including former President Obama, as well as key members of the Trump administration, including counselor to the president Kellyanne Conway and the president's attorney and former New York City Mayor Rudy Giuliani. As the Emmy-Award winning journalist and anchor of CNN's Cuomo Prime Time, he regularly speaks truth to power with prominent figures, while reporting on breaking news from CNN headquarters in New York, Washington, D.C. and around the globe. From presidential elections to natural disasters to investigative reporting, Cuomo has covered nearly every major event in recent history, along the way earning honors including the Polk and Peabody awards for team coverage, as well as the Edward R. Murrow award for breaking news coverage. "Chris is a remarkable journalist, with a history of tough interviews that have everyone talking the next day," said Megan Liberman, Senior Vice President of News, Talk, and Entertainment at SiriusXM. "On his new SiriusXM show, Chris will continue that tradition of fostering important, engaging conversations, while also giving listeners the bigger picture about what's going on in Washington and beyond." "The opportunity to deal with listeners directly about the biggest news stories and to share different sides of my personality and outside interests for two hours a day on SiriusXM – and then have Cuomo Prime Time ready to go at 9:00 p.m. EST? – wow! Dream come true! #LetsGetAfterIt," said Cuomo. Let's Get After It with Chris Cuomo will air live on weekdays from 12:00 – 2:00 p.m. ET on the non-partisan SiriusXM P.OT.U.S. channel. In addition to spirited conversations with listeners and newsmakers, the show will also provide Cuomo with an opportunity to open up about his passions in everyday life, from family to fitness to fishing. Fans can watch a preview video of Cuomo talking about his plans for his new show here. In addition to listening to Let's Get After It on channel 124, SiriusXM subscribers with streaming access can hear the program on a wide variety of connected devices including smart TVs, Amazon Alexa devices, Apple TV, Sony PlayStation, Roku, Sonos speakers and more. His CNN program, Cuomo Prime Time, can be heard by tuning into SiriusXM's CNN simulcast channel 116. Go to www.SiriusXM.com/AtHome to learn more.